Lion Lamb Blog -- David Mundy: Hope for Gaza? Some of you may recall me writing about Bob McClure, the outspoken Canadian medical doctor who spent years working in China with a dedication which rivaled the better known (here) Norman Bethune. Fifty years ago Bob was the first layperson elected as moderator, even though he was anything but moderate in his opinions and outlook. He was a family friend and came to speak to the two congregations I served in the 80's. Bob also worked in Gaza as a doctor and he commented that Sunday morning that the most desperate person in the world is the young person with no hope. More than 30 years later this still holds true in Gaza. People have been dying there - more than 100 so far - as they gather at the border fences with Israel. They are there every Friday for protests which they call the Great March of Return. Some of the protesters are angry and menacing and throw rocks at Israeli forces. The terrorist organization Hamas does incite them to storm the borders to reclaim land from which they were evicted 70 years ago and the Israelis claim, with a degree of truth, that they are defending themselves from this insurgent mob. The reality is that the residents of Gaza and the West Bank are in a de facto prison camp which has the third highest population for area on the planet. Basics such as water and electricity and sanitation are spotty, at best, and there is high unemployment. There is generational desperation as circumstances worsen. The response to unrest by the Israelis is swift and increasingly punitive. The bullets fired by IDF soldiers are meant to inflict maximum injury and along with the 100+ deaths there have been thousands of injuries. To date there have been no Israeli deaths and only one minor injury to a soldier. 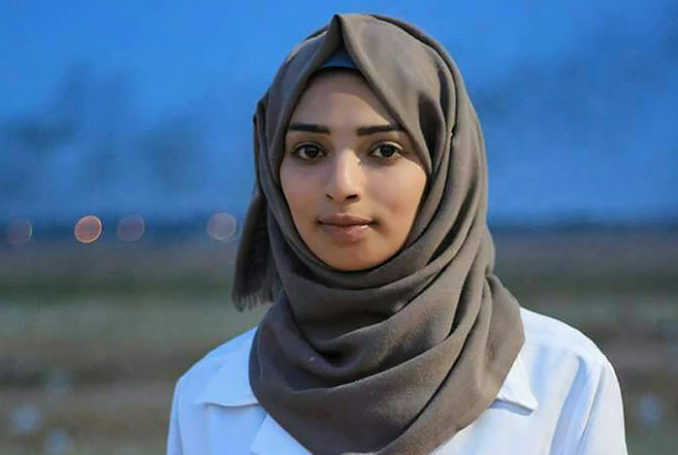 A few days ago a 21-year-old Palestinian woman named Razan Al-Najjar was shot and killed while going to the aid of injured protesters even though she was clearly marked as a medical worker and had her hands raised when she was hit. She was shot by a sniper who would have lined her up in his sights and ended her life. "We have one goal - to save lives and evacuate [wounded] people," she said. "We do this for our country," she continued, adding that it was humanitarian work. Razan also dismissed societal judgement towards women working in the field, where she herself would put in 13 hour shifts, beginning from 7am until 8pm. "Women are often judged but society has to accept us," Razan said. "If they don't want to accept us by choice, they will be forced to accept us. Because we have more strength than any man." To speak out about these injustices leads some to claim that there is a naivite about the complex situation in this region of the Middle East, or that there is an abiding anti-Israel sentiment which is akin to anti-Semitism. Yet there are thoughtful Jewish voices, including those of Israelis, which remind us that the God of the bible is on the side of the oppressed and the marginalized and that what is happening to the Palestinians is a violation of fundamental human rights and the Geneva Convention. We can pray that the killing ends and justice is done. If you want to be better informed you might read My Promised Land: The Triumph and Tragedy of Israel by Ari Shavit or I Shall Not Hate: A Gaza Doctor's Journey by Izzeldin Abuelaish. I Shall Not Hate remains one of the my favourite, most inspirational books of all time.